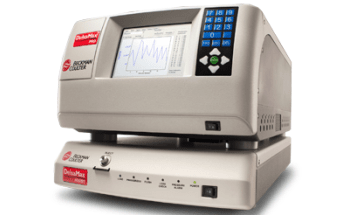 The DelsaNano series is a new generation of instruments that use photon correlation spectroscopy (PCS), which determines particle size by measuring the rate of fluctuations in laser light intensity scattered by particles as they diffuse through a fluid, for size analysis measurements and/or electrophoretic light scattering (ELS), which determines electrophoretic movement of charged particles under an applied electric field from the Doppler shift of scattered light, for zeta potential determination. This series has a broad range of capabilities, including conventional static and automatic titration measurements for both size and zeta potential distributions of suspended particles in a wide range of size and concentration. The DelsaNano also can measure zeta potential of a solid surface or film. Carbon nanotubes (CNT) were discovered in 1991. Many attempts have been made to create devices based on CNT properties, such as electronic state and layered, cylindrical structure. Lately, various CNT applications (e.g., gas sensors, lithium ion batteries, bio-related products) have been proposed. Considerable research on CNT applications is underway in the fields of electronics, physical properties, and physics. On the other hand, however, research has lagged in the fields of chemistry, biochemistry, medical science, and pharmaceutical science. The reason is that CNT is solubilized in neither water nor organic solvents. To date, solubilization has been attempted with various methods, and methods based on chemical bonding, physical adsorption, etc., have been reported. In this study, a CNT sample was dispersed with a surfactant. Particle size and zeta potential were measured before and after the addition of surfactant. The CNT sample used was a multiwalled CNT from Aldrich with an outside diameter of 20-30 nm, an inside diameter of 1-2 nm, and a length of 0.5-2 ìm. Suspensions were prepared so as to yield a particle concentration of 1 mg/ml in distilled water and in 1% aqueous solution of SDS, respectively. After one hour of ultrasonic dispersion, particle size and zeta potential were measured by using the DelsaNano C, a zeta potential and submicron particle size analyzer. The particle size distributions are shown in Figure 1 and the zeta potential distributions are shown in Figure 2. It is evident that, by adding SDS, the absolute value of the zeta potential is increased, and conversely the particle diameter is decreased, thereby yielding a better dispersed or solubilized suspension. Figure 1. Zeta potential distributions. Figure 2. Particle size distributions. This information has been sourced, reviewed and adapted from materials provided by Beckman Coulter, Inc. - Particle Characterization. For more information on this source, please visit Beckman Coulter, Inc. - Particle Size Characterization.